Last time we discussed the basic need for protecting plants from hungry critters, and what sort of materials you might choose to use. We also mentioned briefly the need to think about what sort of longevity you wanted to have in these structures. Let’s talk a little more about that. Say I wanted to create a simple, easy to assemble, temporary cover for a plant – just something to keep the bunnies from munching on it until it was big enough to not mind an occasional trimming. A simple piece of chicken wire, held in shape by a couple of zip ties or twist ties would do the trick. If I needed to hold it down a rock, or a landscape spike or two would keep it in place (we have high winds where I live on a regular basis). I have a section of flower bed in the yard where I grow Violas. Last year the baby bunnies were sneaking into my yard and munching them, so I quickly threw up a piece of hardware cloth and held it in place with short pieces of rebar. 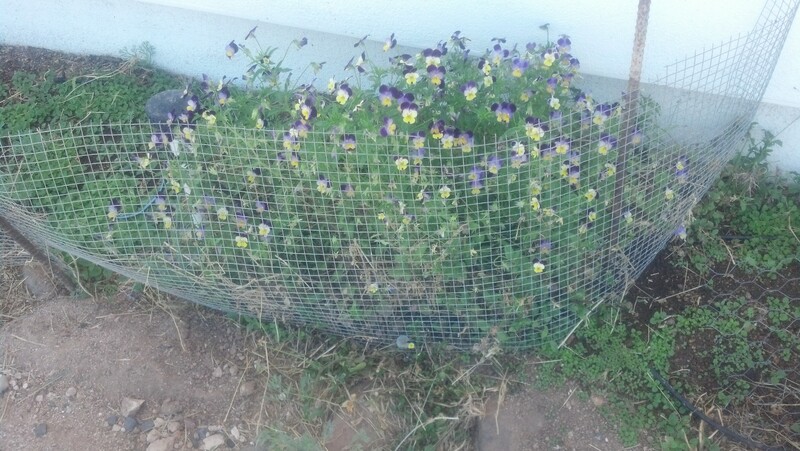 I had actually planned to do something fancier, but time got away from me, and by the time I realized it the violas had grown through the hardware cloth and created a lovely cascade of flowers, the majority of which was protected from bunnies. So I left it. The marauding bunnies have once again trimmed the violas outside of the hardware cloth this year, but not the plants or seedlings on the inside. I am planning to rebuild the enclosure next year, but meanwhile my “stock” of naturally reseeding violas is safe from the rabbits. There is a wonderful kitty at our house named Jesse James. He totally loves playing out in the yard, chasing grasshoppers and lizards. But he also loves to use my freshly dug garden beds as a litter box. Something that I do not approve of. So, when I plant a section of garden bed, as soon as it is planted I water it (he does NOT like mud) and then I cover it with a piece of wire. It may be chicken wire, or in the case of larger plantings, like my potato bed, field fencing, but it keeps out the kitty and allows the plants to grow safely. In the case of the potato bed, I remove the wire when I hill up the potatoes and put down plastic mulch between the plants. 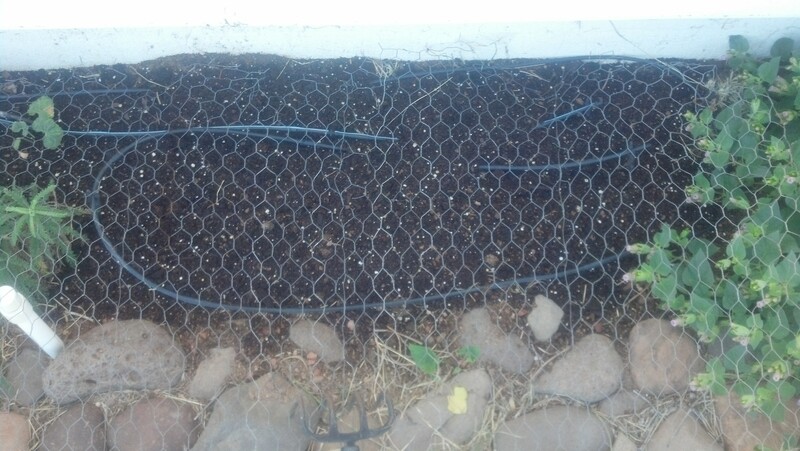 Sometimes I simply leave the chicken wire in place on the ground and let the plants grow up through it. If you are growing Cat Mint (catnip) you may find it necessary to make a cover for your plant. Cats will sometimes eat the plants all the way down to the ground in their search for a “feline high”. It can actually kill the plant. A simple chicken wire “hat” should be enough protection. The cats will trim it to the wire, but the plant will survive. So be sure to chose a pleasing shape for your wire hat – think of it as a topiary form. If you are a scrounger like me, don’t be afraid to use other “found objects” to help protect your plants. Another excellent example of a sturdy barrier is expanded steel mesh. I once used a wire drawer to keep my kitties from sitting on the seedlings that I was starting in the dining room. There are lots of options if you think outside of the box.